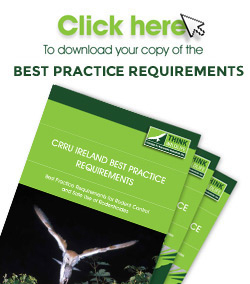 The Best Practice document provides guidance on rodent control for professional pest management officers and has as its objective improving the effectiveness of rodent pest control programmes while minimising risks that arise for non-target species including Barn Owls, Red Kites, Buzzards, Kestrels, Peregrine Falcons, Stoats and Pine Martens. Although anticoagulant rodenticides are essential to ensure the protection of human and animal health, and to maintain food hygiene, it is essential that Best Practice be followed to avoid widespread contamination of non-target wildlife, some of which are of high conservation value. So having Pied Piper Chemicals Ltd., alongside our existing campaign members adds valuable weight to the work of CRRU Ireland. This brings to ten the number of CRRU supporting companies. The other nine are BASF plc, Bayer CropScience, Bell Laboratories Inc., Killgerm Group, Lipha Tech S.A.S., LODI UK Ltd., Pelgar International Ltd., Rentokil Initial plc, and Syngenta Crop Protection Ltd.